When agile companies first consider localizing digital content, an irresistible force often meets an immovable object. Their insistence on continuous delivery and flexible operation is confronted by the perception that linguistic translation is an unavoidably slow, rigid, and sensitive process. With speed deemed impossible and errors considered fatal, the majority of these companies either postpone multilingual plans indefinitely or settle for releasing localized content on a considerable delay. There is, however, an emerging class of agile organizations that have found a way to engage global audiences and preserve their founding principles. Here’s how you can join their ranks. Companies have rightly recognized that the standard pace of translation is incompatible with agile operation. What is standard does not have to be what is accepted, however. As with many other business processes, content translation can be accelerated by the strategic use of automation. The automation we’re concerned with here is not machine translation (though you may ultimately find a use case for it). The automation that exponentially increases translation speed has much more to do with the mechanics of how content is gathered, discussed, and distributed. 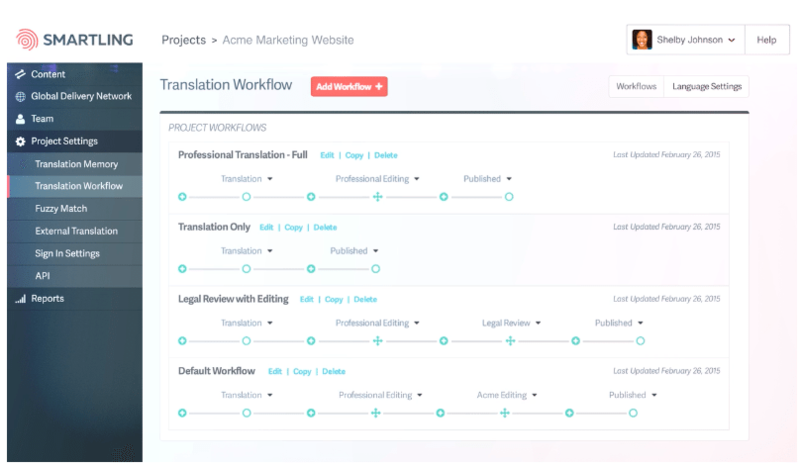 Translation proxy and API-based solutions can eliminate months (or years) of manual development work formerly required to extract and replace text within a maze of content management systems. Dedicated translation management software can cut weeks off turnaround times by centralizing and simplifying collaboration. Intelligent context tools can spare translators hours of guesswork and reviewers hours of correction. All of these automated innovations will require upfront financial and/or technical investments, of course. But once your well-oiled machine is up and running, localized websites and apps can sprint from “planned” to “published” in the time it takes your competitors to approve a single page. A lack of technical sophistication isn’t the only reason translation strategies advance at a glacial pace. Subscribing to the notion that you must translate your content catalog completely and publish all translations simultaneously is often just as limiting. Agile companies understand this intuitively. Instead of delaying delivery until a comprehensive solution can be assembled behind the scenes, their teams strive to share functional solutions immediately and add value continuously. Localized content can work the same way. Just as a software product can be broken down into essential and auxiliary features, content experiences can be broken down into essential and auxiliary components. An eCommerce retailer, for example, would likely deem translating its online shopping cart a higher priority than translating its blog archives. How you choose to define your minimum viable localized content will depend on a variety of factors — but it’s a crucial exercise to complete. Acknowledging that some assets are inevitably more valuable to your target audience than others is the first step in avoiding the “all-or-none” translation trap. Instead of forcing large, occasional batches of content through your translation machine, feeding it a continuous stream of prioritized strings will be better for all involved. Audiences will have access to localized content quicker and your colleagues will find translation feels like a much more sustainable business strategy. If we agree that not all of your content is of similar type or value, then it makes little sense to route every string of source text through the same translation workflow. One-size-fits-all processes will only be another obstacle in your quest for speed and quality. Strategically limiting the number of translation steps and collaborators assigned to certain categories of content is one of the simplest and smartest ways to reduce turnaround times. When translating product descriptions for the bottom 10% of a retailer’s inventory, for example, there’s rarely a reason for that content to pass through the hands of three editors, two legal reviewers, and a local SEO expert prior to publication. Customization should not be interpreted as elimination, however. Applying exceedingly lean quality control measures to especially sensitive categories of content will ultimately invite the kinds of errors that risk brand reputations and prolong localization efforts. To consistently strike the right balance for each piece of content, you’ll need the support of software solutions that allow for granular control and automated templates. Another reason we see teams overcompensate on translation review is the simple fact that they’ve been burned by bad correction cycles in the past. They’ve seen inadvertent errors and embarrassing mistakes lay dormant on localized websites and apps for weeks at a time, praying audiences don’t notice any blunders before developers can publish the next update. The cost of those lingering errors is only increasing in the era of customer experience, and that’s surely part of the reason why more companies are shifting toward agile operation in the first place. But when your organization rides the razor’s edge between delivery speed and quality control, some translation mistakes will inevitably slip through. When such scenarios arise, companies with the automated content connections we discussed earlier will be able to breathe a sigh of relief. Any of their qualified teammates can quickly log into their translation management platform and instantly resolve problematic strings without any IT assistance. As a result, linguistic bug fixing becomes a swift and continuous process. Now that we know workflows can be flexible and errors don’t have to be fatal, there’s one last layer of intrigue to consider adding to your agile translation strategy: Publishing less-essential and low-priority content before it’s fully reviewed. We know this sounds like sacrilege to some, but applying the four preceding principles actually makes it a safer strategy than it might seem. Automation and customization significantly increase the odds of translators processing strings correctly the first time — while simultaneously reducing the time and effort it takes to correct errors. Additionally, thoughtful content audits will help ensure this approach is strictly reserved for the right scenarios. Lastly, it’s important to remember that this tactic doesn’t eliminate editing and review steps altogether. The sequence of steps is simply being altered to support a strategy of sharing content sooner.